The Japanese American National Museum announced on Nov. 7 that it has completed the conservation, cataloging, and digitization of 197 pen-and-ink drawings by artist Miné Okubo, which now may be viewed on JANM’s website. Okubo (1912-2001) was an artist, writer, and social activist who created drawings and sketches of her life while at Tanforan Assembly Center in San Bruno (just south of San Francisco) and Topaz concentration camp in Utah during World War II. She received numerous awards, including the American Book Award in 1984 and a Lifetime Achievement Award in 1991 from the Women’s Caucus for Art. 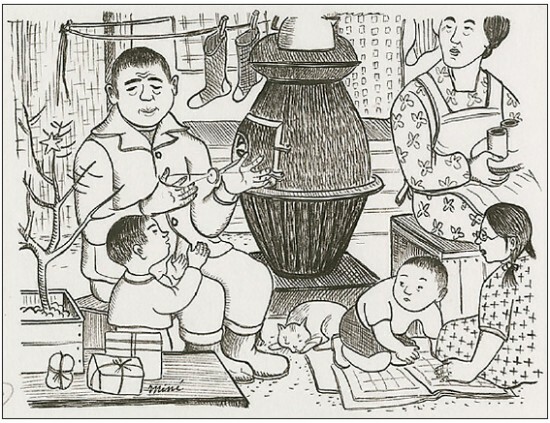 In 2007, JANM was bequeathed a collection of 197 pen-and-ink drawings, all originals and signed by Okubo, representing more than half of her extant work from the concentration camp period. These drawings, coupled with her commentary, served as the basis for her renowned book, “Citizen 13660,” which was printed in 1946 and was the first personal account published on the camp experience. This collection had not been exhibited or made readily available to researchers in the past because it required conservation. Through a generous grant from the National Endowment for the Humanities, JANM’s Collections Management and Access staff facilitated, catalogued and prepared all 197 drawings. To view the collection, visit www.janm.org/collections/mine-okubo-collection/.